Virtual Surveyor has eliminated the need for clients to use third-party applications to prepare data for processing. Released this week, Virtual Surveyor 6.1 now handles on-the-fly projections that previously required a separate software package to set the data in the proper coordinate system. Virtual Surveyor has become popular among surveyors because the product bridges the gap between UAV photogrammetric processing applications and engineering computer-aided design (CAD) packages. The software generates an interactive onscreen environment with UAV orthophotos and digital surface models, where the surveyor selects survey points and breaklines to define the topography, creating highly accurate topographic products for CAD input up to five times faster than otherwise possible. Some customers asked to work only with a CAD file. Although they work with drone data most of the time, they occasionally had to create a surface or contours from a traditional survey. They asked if this could be done in Virtual Surveyor as it would save them from paying for a subscription to a CAD software. Current subscribers to Virtual Surveyor will note their software is being automatically updated. To initiate a free, 14-day trial of Virtual Surveyor, visit www.virtual-surveyor.com. Automatic creation of section lines — V6.1 automatically generates sections from road surfaces to survey transportation routes in minutes. Transparent layers — Users can add topographic or cadastral data to their project and view it through the orthophoto layer to annotate or draw boundaries. Tom Op ‘t Eyndt, Managing Director of Virtual Surveyor nv, said the company has developed a completely new project experience for users of UAV data. Version 6.1 will save customers time and money that was previously spent converting their drone data for processing in Virtual Surveyor. The firm's value proposition has always been to enable surveyors to derive topographic information from drone data and deliver the light-weight meaningful CAD model that engineers need. Not only is version faster, but it also eliminates the expense of purchasing additional software. 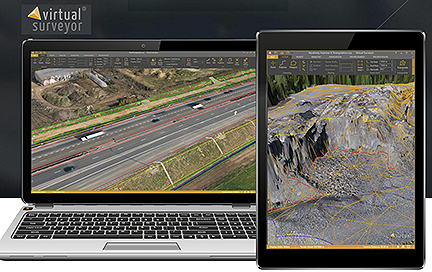 Overall, users will experience a faster processing environment in Virtual Surveyor 6.1, especially during complex tasks, such as making terrain modifications or calculating volumes.